For over half a century, descendants of the families who survived on the frontier of a continent have discovered the Germanna Foundation and found new meaning in understanding the perseverance of those families in nearly three centuries on American soil. A favored way that many members have chosen to honor the memory of family members is through our Germanna Memorial Garden. The site is located behind our Visitor Center on historic Germanna land and which sits at the entrance of our 170-acre Siegen Forest hiking trails along the Rapidan river. The open-air roofed cloister in the Memorial Garden provides a shady, protected place for quiet contemplation or ceremonial commemorations. The families of Trustee Dr. Michael Frost and Honorary Trustee Russell Hitt provided the funds to build this structure for the Memorial Garden, which was dedicated during the Germanna reunion on July 16, 2010. 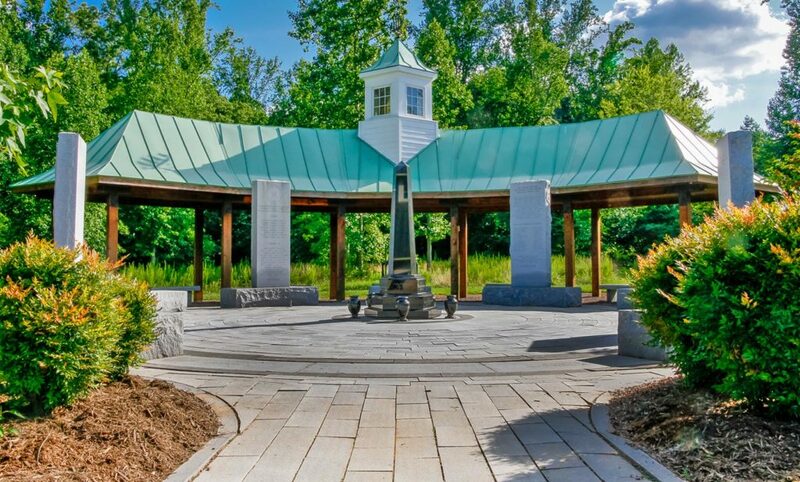 The cloister provides shelter to and visual focus for the Memorial Garden Bell, donated by the Brawdus Martin Fort Germanna Visitor Center architect Douglas Harnsberger. The bell had formerly called the faithful to worship at a Roman Catholic church in California, and after being refurbished by McShane Bell Foundry (which manufactured the bell in the early 20th Century), it was dedicated in the Memorial Garden in 2012. Colonel John Spotswood, son of Governor Alexander and Lady Spotswood, had grown up at Germanna and was reinterred at the Memorial Garden on June 20, 2002 with a simple but dignified service conducted by Father Charles Syndor of St. George’s Episcopal Church in Fredericksburg, where Colonel Spotswood had served on the vestry in the 1750’s. His grave is marked out by an obelisk in the center of the garden. Surrounding the obelisk are rings of stone pavers, many of them engraved to honor or remember a Germanna descendant. If you would like to have a paver engraved, please see the below order form. Two Germanna descendants memorialized on the stone pavers (left) served on the USS Arizona and lost their lives on “the date that will live in infamy,” December 7, 1941. Richard Walter Weaver was a 17-year-old Nevada boy and the sixth great-grandson of the 1717 Germanna colonists Phillip Joseph Weaver and his wife Susanna Klaar (the sister of colonist Hans Michael Klaar, ancestor of the Clores in America). A Kentuckian named Clay Cooper Rector, the son of Wendell Wesley and Lela Florence Cooper Rector. We don’t know for certain if they knew each other, but Richard and Clay were Germanna cousins. Their families were related through the Germanna Broyles, Majer and Volck families. Richard also was a member of the Broyles, Finks, Fleischmann, Schön, Wayland families, while his cousin Clay also descended from the Germanna Bach, Fishback, Heimbach, Hitt, Hofmann, Otterbach, Rector, Rouse, and Ruop families. Clay Cooper Rector was in charge of the storeroom on the USS Arizona, and the last family member to see him may have been his cousin Harrison Clay Rector, who left Pearl Harbor on the USS Anderson just two days before the attack. Richard Walter Weaver had duty that fateful morning of December 7, 1941. He was seen sprinting to his station Number 6 on topside when the alarm sounded summoning all men to battle stations. It was there that the first and most lethal enemy projectile struck. It is for people like these that the Germanna Foundation exists, that we remind each other in gratitude of the shared sacrifice of our ancestors and kinsmen who built America. Some of the people remembered with engraved stone pavers in the Memorial Garden gave their lives in the defense of the United States. Some paver stones were given to celebrate the birth of child. Others to honor a graduation or a retirement. There are even a few family trees in stone, where a visitor can hop from one generation to the next, all the way across the Atlantic Ocean.